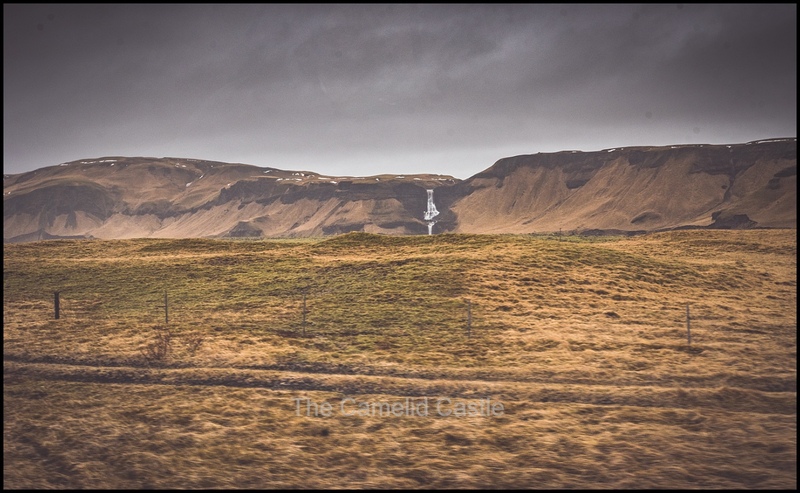 Day 7 of our Iceland motor home adventure was again full of stunning scenery. 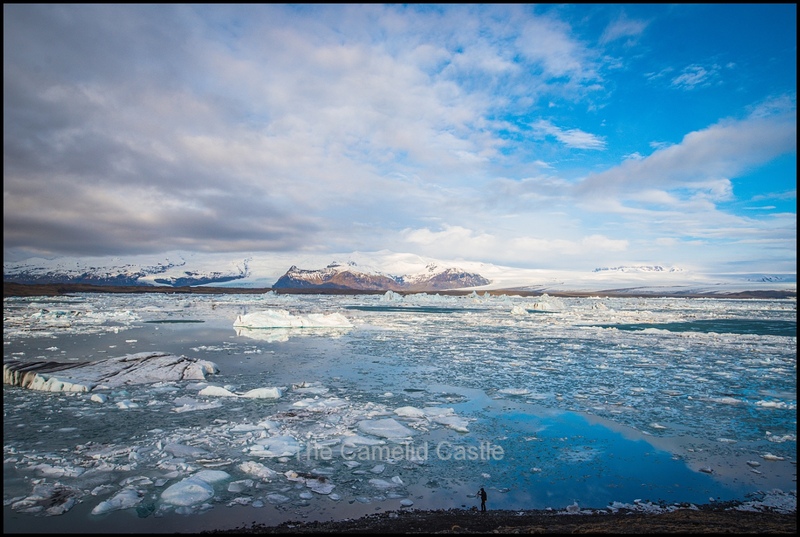 We were travelling down the South-East coast and after spending the night camped at the Jökulsárlón glacial lagoon we got enjoyed more stunning lagoon views and the ice diamond beach in the morning before heading to the nearby Fjallsárlón glacier lagoon with black icebergs! 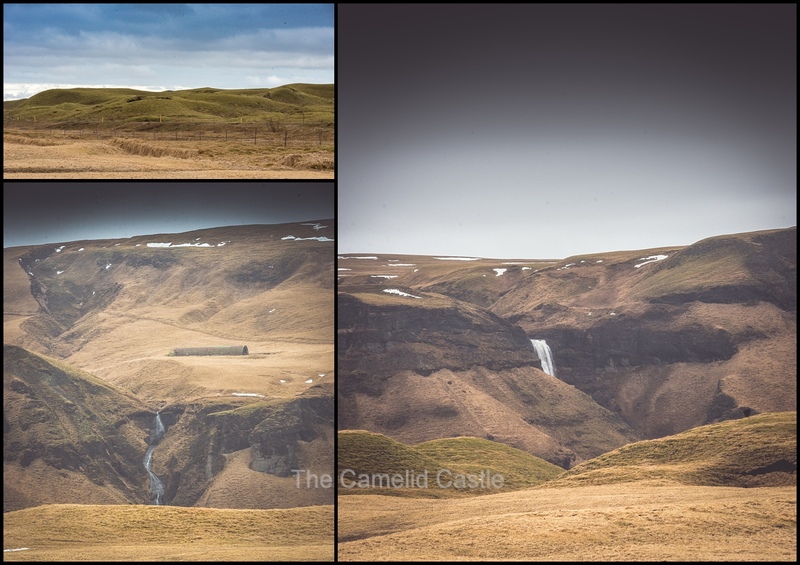 Then we headed to Hof for a turf covered church and the Skaftafell National Park for a hike to the Svartifoss waterfall. 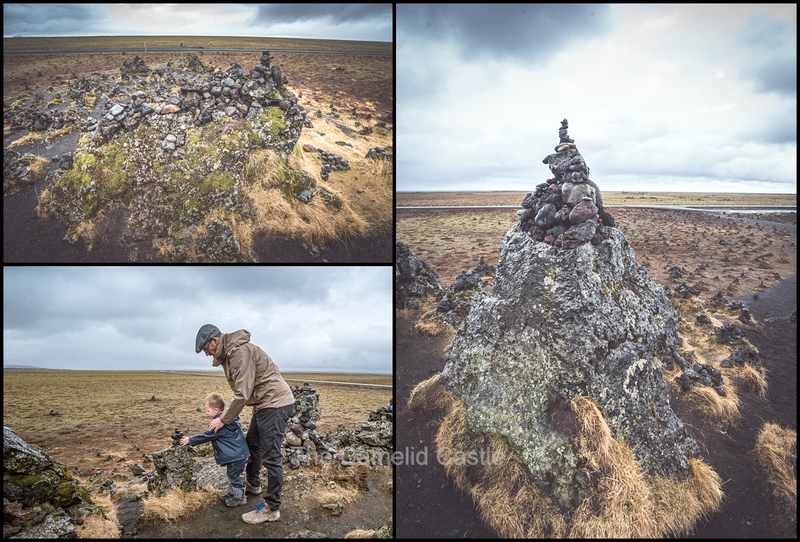 The afternoon had us on the scenic South coast, with a visit to the fortune stones at Laufskálavarða Lava Ridge before camping for the night in the town of Vik after visiting the spectacular (and dangerous) Reynisfjara Beach. 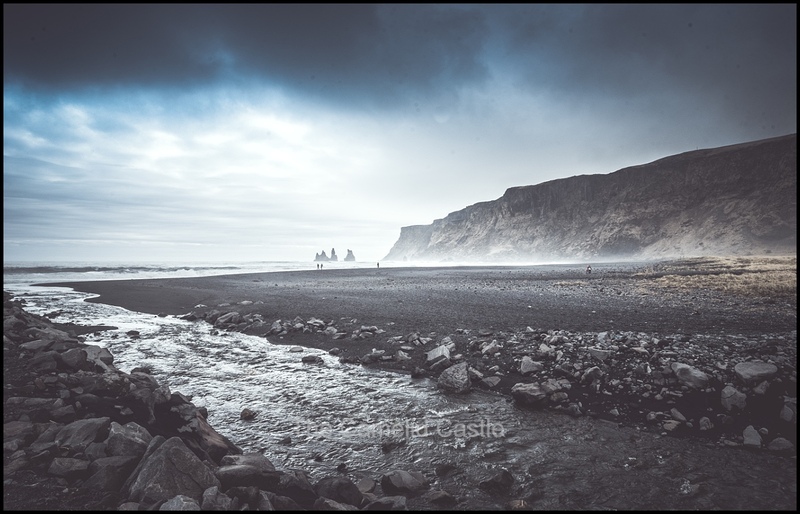 A black rock beach that is most famous for the Reynisdrangar Columns, huge basalt hexagonal columns rising up out of the black sand and ‘sneaky waves’. After another late night aurora hunting we all woke up what seemed like way too early again at around 6.30am. 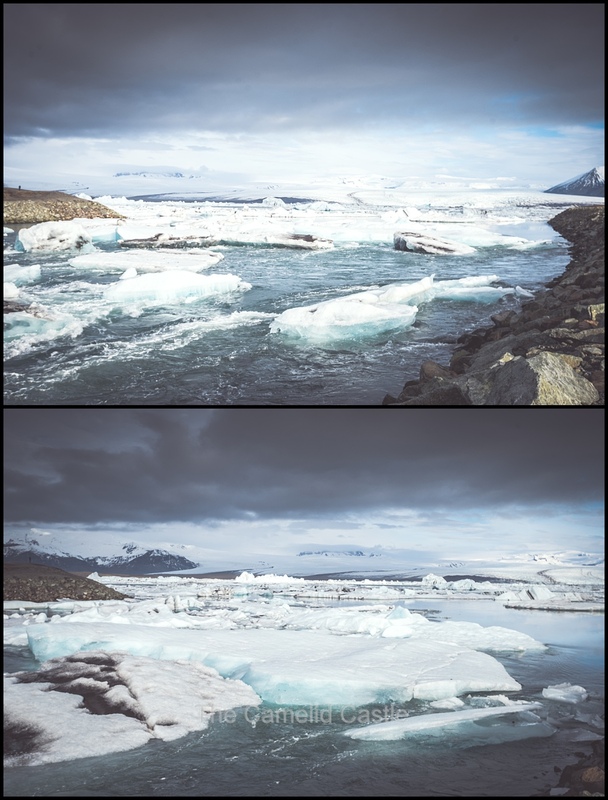 Before breakfast I went out for a quick look at the glacial lagoon, where it was almost sunny….giving entirely different views from the previous stormy afternoon! I had been up at 4am but decided not to go out for sunrise lagoon shots (sunrise was about 4.20am) and sleep instead. After aurora hunting until well after midnight I was being a lazy photographer, or at least a tired one! I was still rewarded with beautiful morning views over the lagoon………. At 6.30am it was very quiet with the only other people around the few other campers. It was still a bit too early for the tourist rush. More icebergs had broken off overnight and with the sun shining the lagoon was entirely different to the night before. You can see the scale of the lagoon by looking at the above photo and noticing a fellow early-morning photographer in the bottom right. It was a sight to behold! Keen to get out on the lagoon we had a quick breakfast of cereal and then rugged up and went for a walk to check out the lagoon in the morning sunshine. Astrid and Soren were also impressed to have the place essentially to ourselves. It certainly added to the magic! With the increase in tourism to this spot, the safety signs were everywhere. Apparently tourists regularly do dumb things like trying to swim in the lagoon and walk on the ice. It’s full of icebergs (and seals and whales), I wouldn’t have thought you’d need a sign to tell you you’ll freeze to death pretty quickly in that water, but apparently people regularly attempt it. There was certainly more ice in the morning and it looked very different to the previous night. I could have camped here for a week to see it constantly changing. 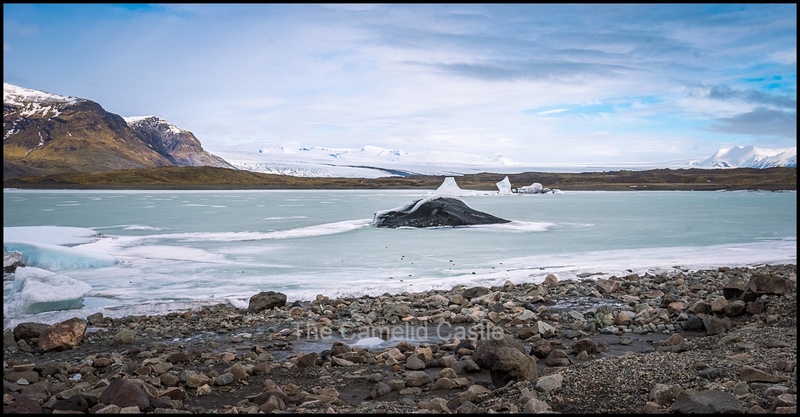 We wandered down to the ice beach to see how that looked in the morning light. Again lots of ice had washed up overnight. There was no one yet around and we had the place to ourselves. 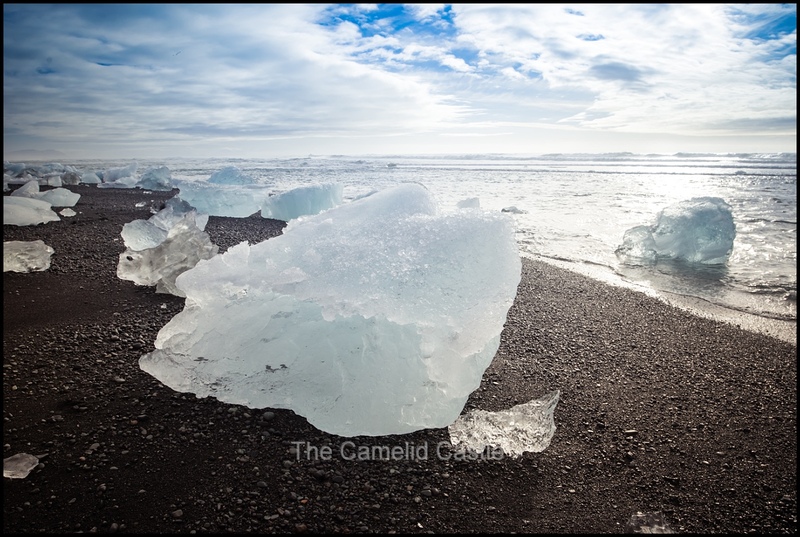 It’s difficult to describe how amazing the beach looked with all those giant icebergs scattered all over it, there were some quite sizable ones this morning! 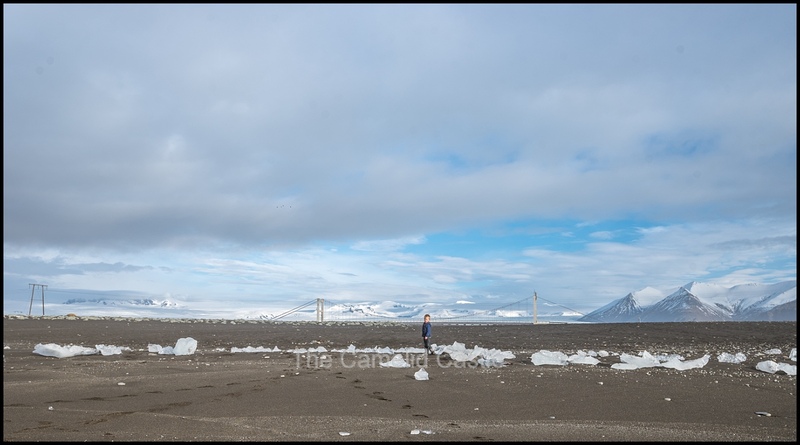 How often do you get to run on a beach littered with giant ice diamonds? 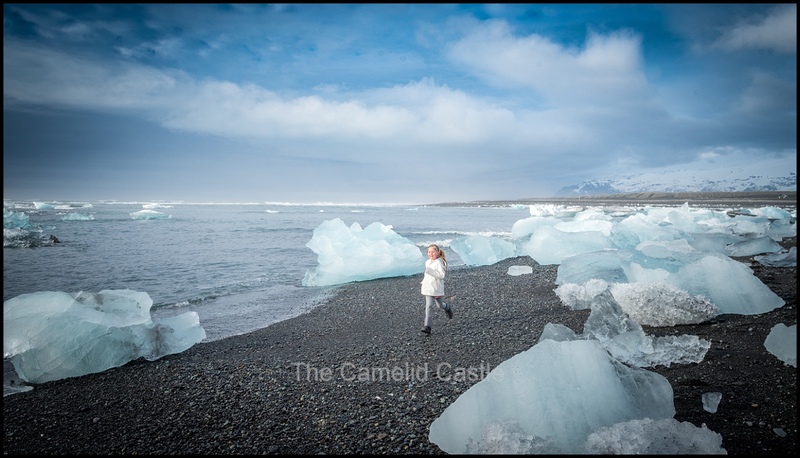 Running through the ice chunks and climbing on them was a highlight of the trip……. 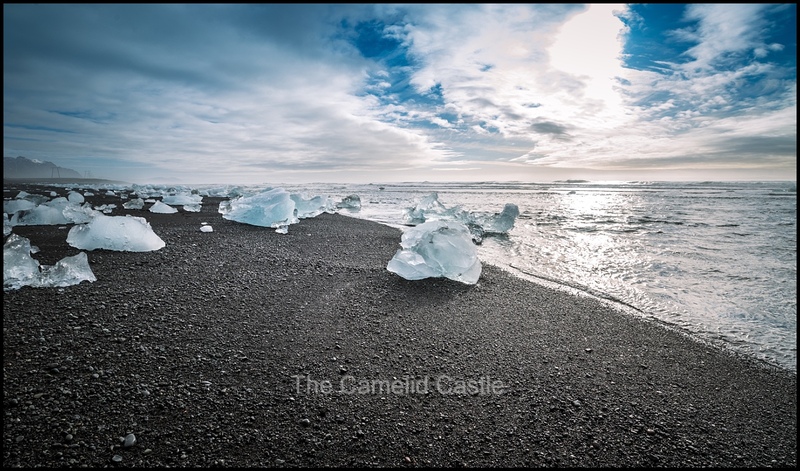 We reluctantly bid the ice diamond beach farewell and walked back towards the lagoon, watching more ice drifting out into the Atlantic Ocean from the lagoon. The tide was quite strong this morning and it was amazing watching it all being carried out, some pieces were bigger than your average house! With another big day ahead we had to bid farewell to an absolutely amazing place. 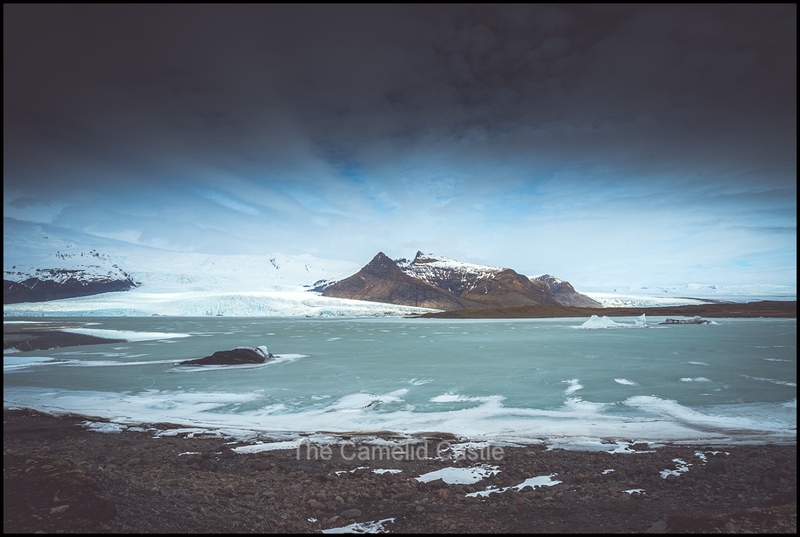 The decision to camp here overnight had been a good one as we got the pleasure of seeing the lagoon and beach in various lights, and not having to rush our visit ……… or fight off too many tourists once the crowds for the day had diminished. Luckily we had another treat in store. 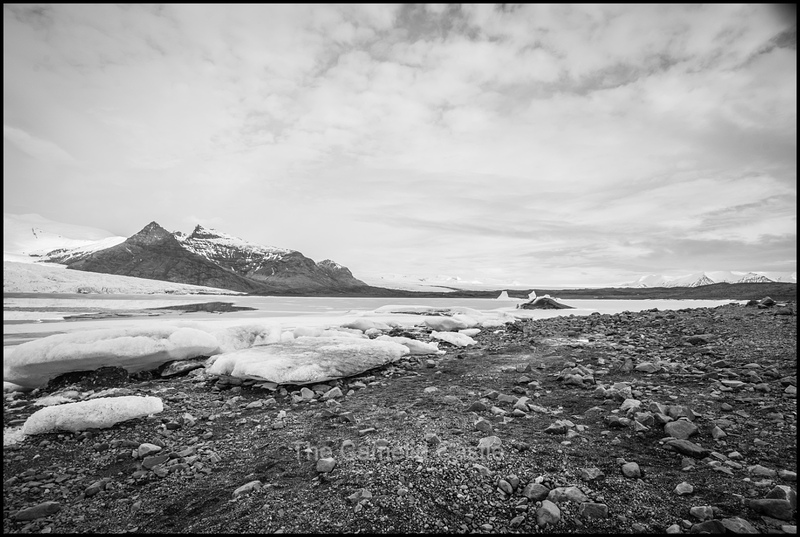 Ten minutes down the road is another glacial lagoon – Fjallsárlón. 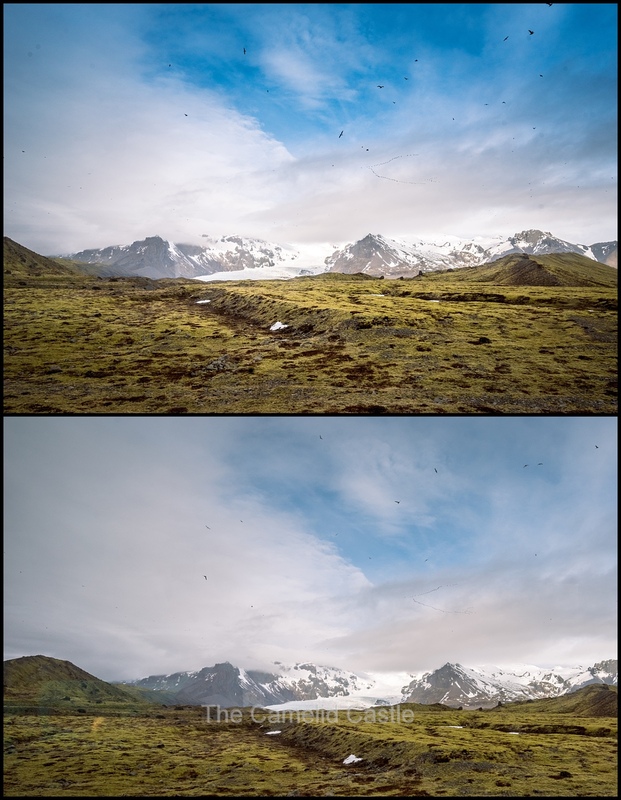 Fjallsárlón is a glacier lake at the south end of the giant glacier Vatnajökull. 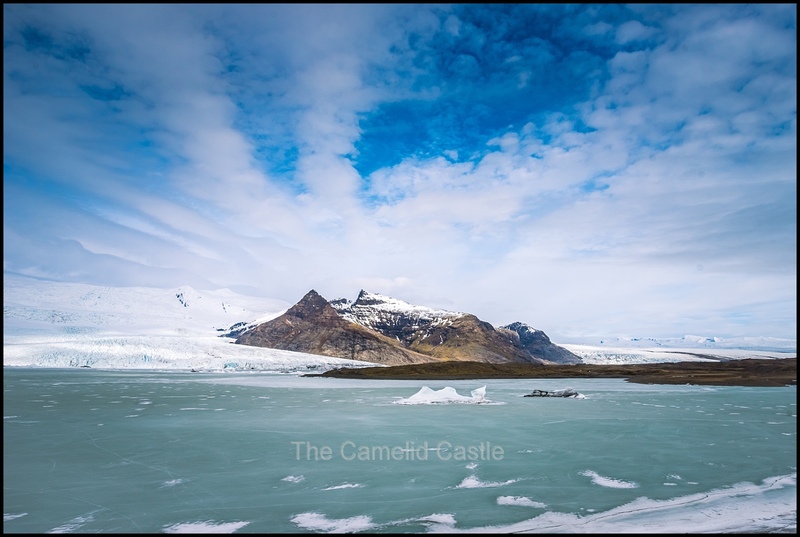 As the Fjallsárlón lagoon is much smaller you have a better view of the whole lagoon and a much better view of the edge of the glacial tongue where the icebergs fall into the water. We made it to Fjallsárlón before most of the tourists had arrived. 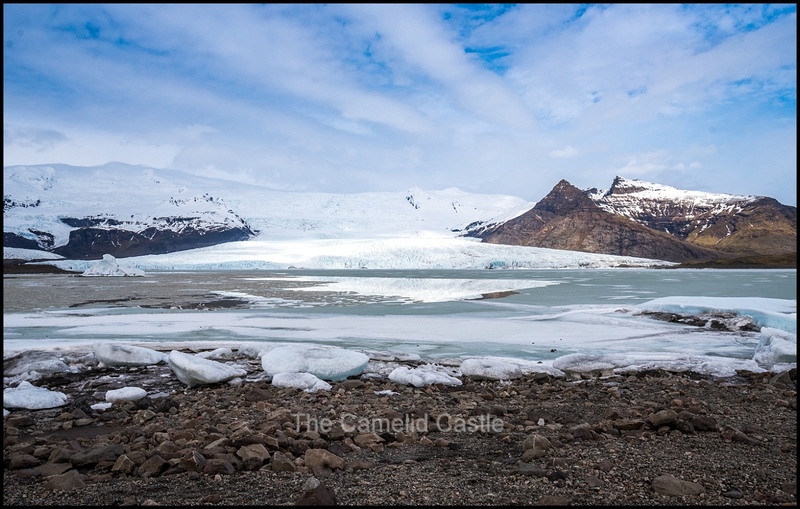 While the icebergs floating in the lagoon were a little smaller, it was definitely easier to see the glacier as we hiked around. A few zodiacs were already buzzing around the lagoon. 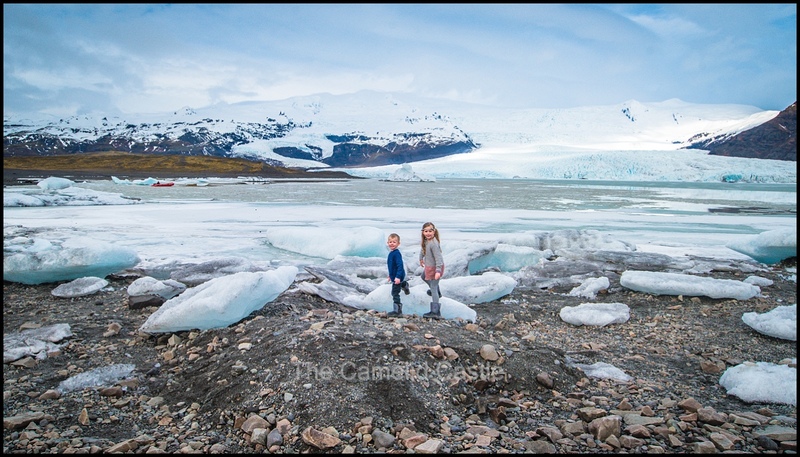 The tours of the glacier didn’t start until early May due to the amount of ice, but it looked like they were taking tourists over to the glacier edge for glacier walks. The temperature this morning was much milder, and despite being surrounded by ice we were happy to be out without our snowsuits or coats on! 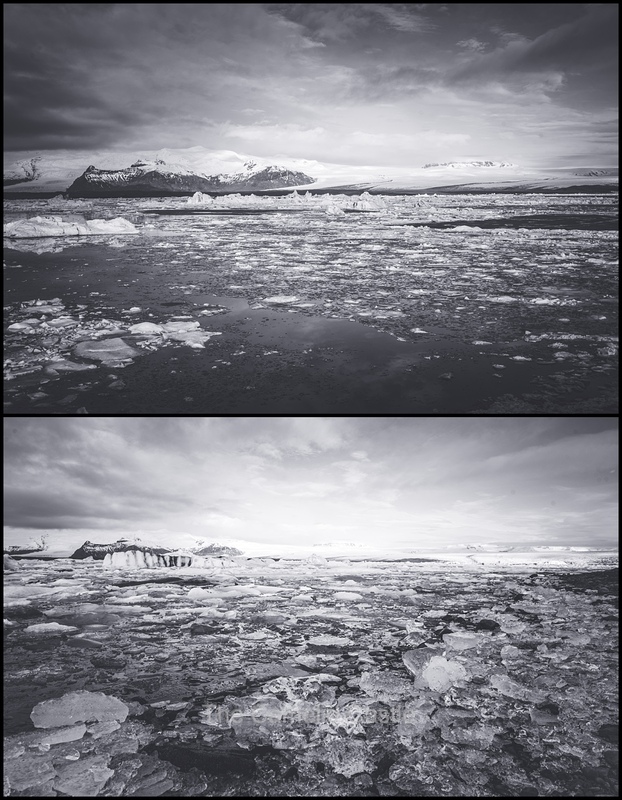 Some of the icebergs inside the Fjallsárlón were black which was a different look to Jökulsárlón glacial lagoon. 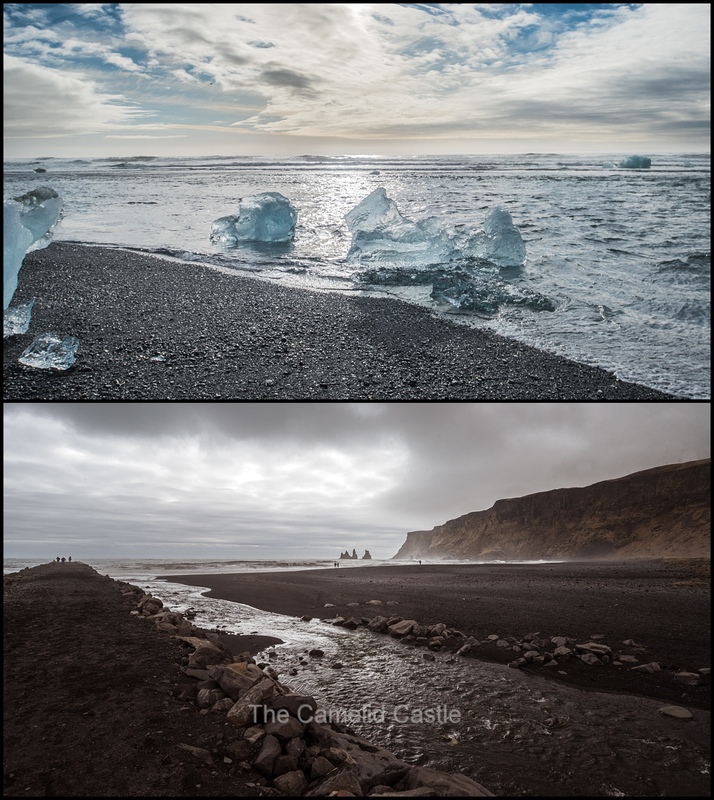 Despite being smaller than Jökulsárlón, the scale was certainly impressive. When you see people hiking around the edges of the lagoon you can see how vast the lagoons are. 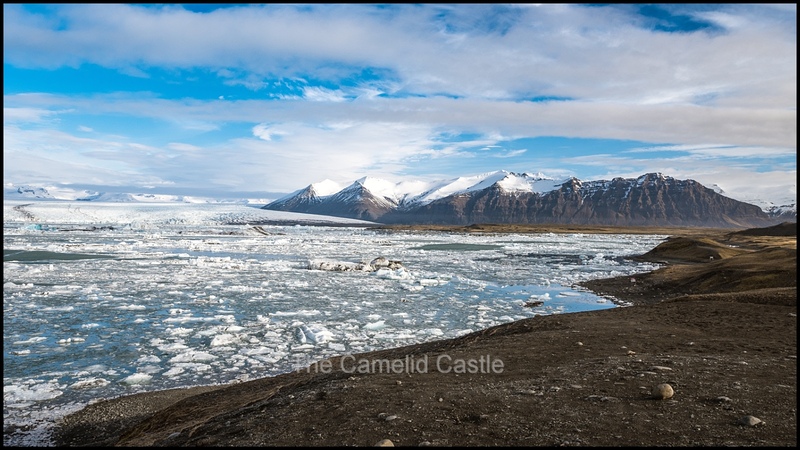 After an explore of Fjallsárlón we headed back to the motor home and continued on our route South along the coast towards the town of Hof (not to be confused with Höfn where we lunched the day before on the edge of the Vatnajökull glacier). We arrived in the tiny town of Hof to check out the famous turf church. The practice of covering the roof with turf dates back to Medieval times throughout Europe to protect from the harsh weather. They happened to be re-turfing the roof which was amusing! 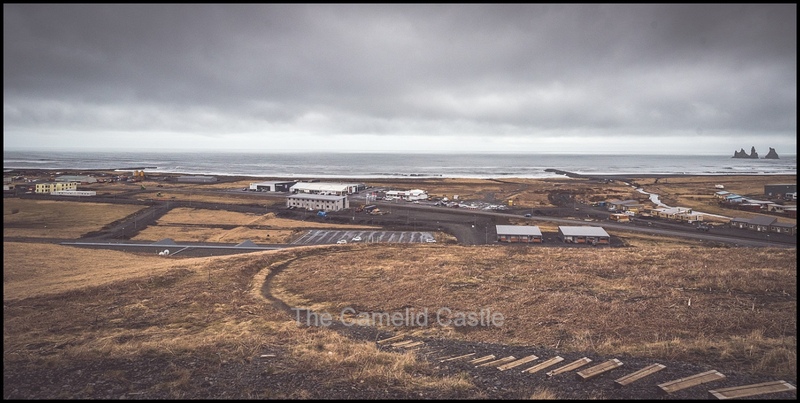 There wasn’t much else to see in the town so it was onwards to our next stop of Skaftafell – a wilderness area in Iceland’s Vatnajökull National Park. 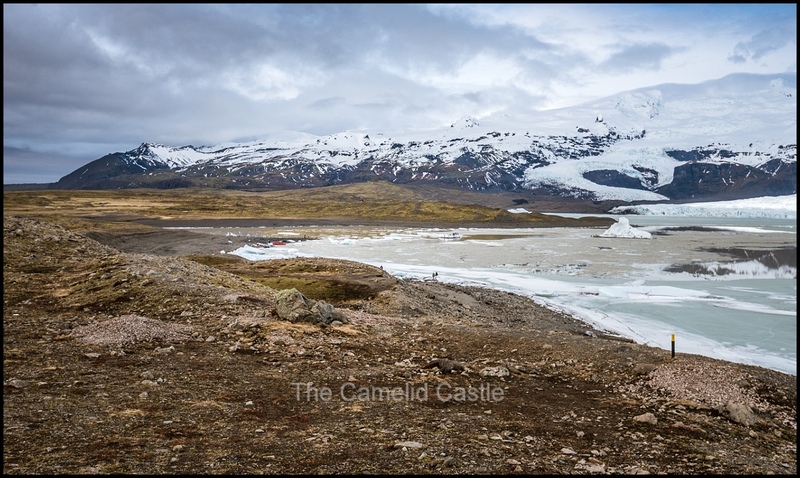 The camp ground in Skaftafell was the original planned stop for the previous night, but given we didn’t make it there until 10.45am we were glad we’d stopped overnight at the glacier lagoon. Giving us extra time to enjoy that spectacular location and cutting down the driving time in one day. The car park at the visitor information centre ad Skaftafell was the first paid car park we’d encountered in our trip around Iceland. 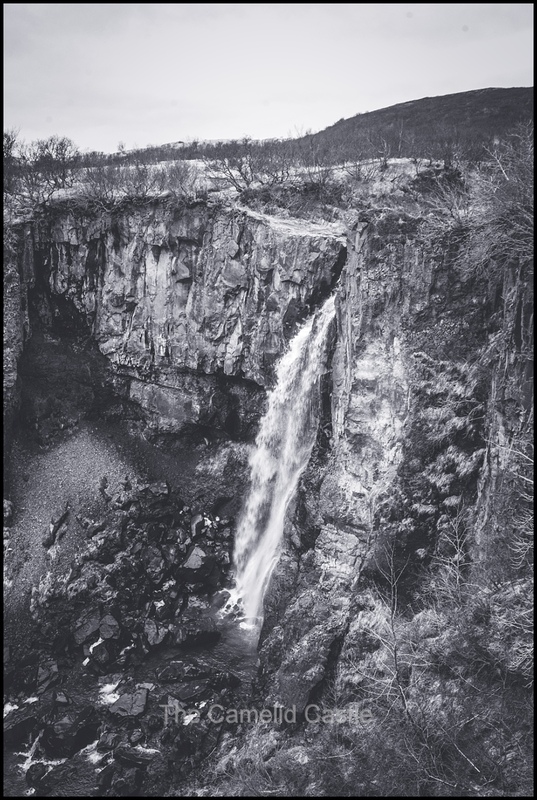 It signalled the start of the more touristy nature of the South. 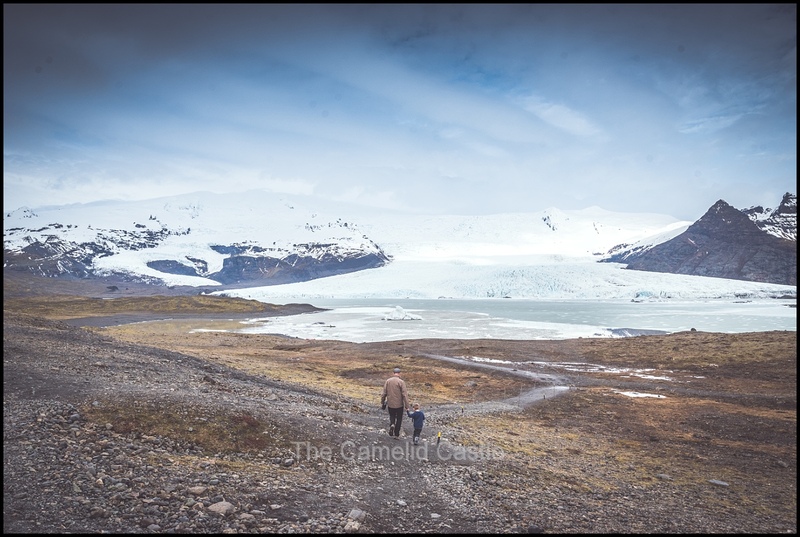 You could spend many days hiking all the trails around Skaftafell, including lots of glacier walking and climbing tours. 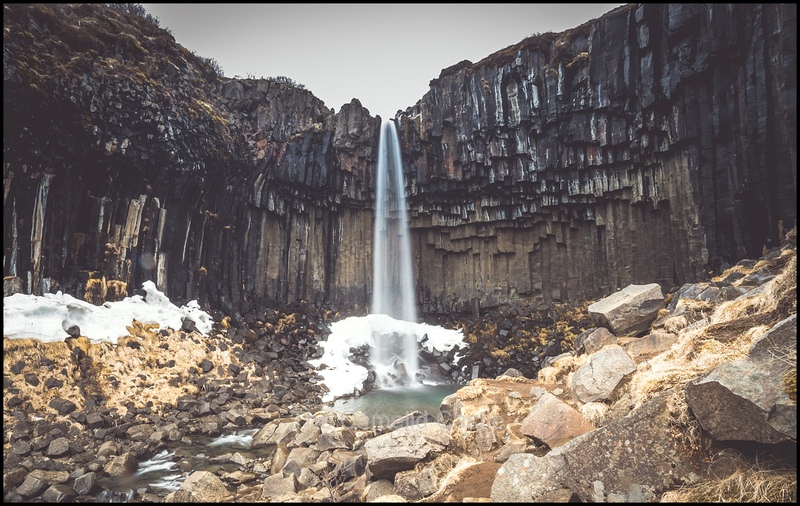 The most popular hike leads to Svartifoss, a thin waterfall surrounded by columns of basalt. The hike is around 5 kilomtres long and offers great views alongside the river and towards the ocean in the distance. 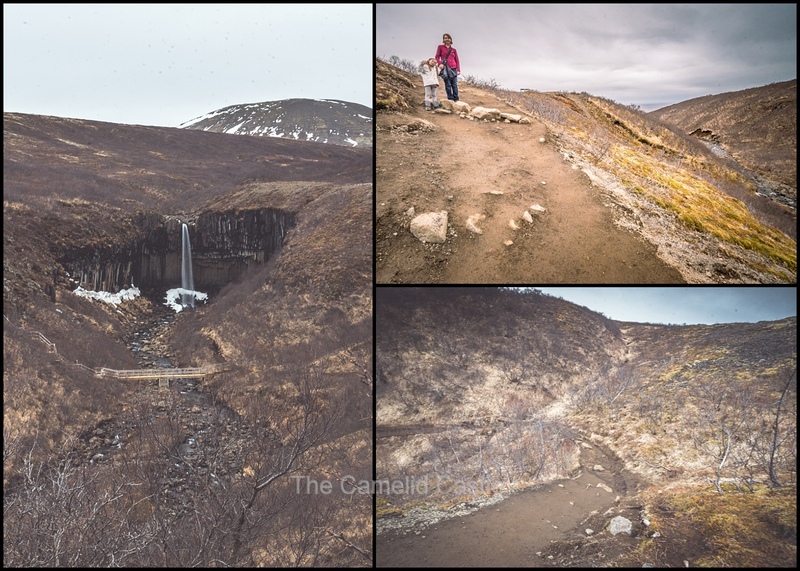 It was quite steep most of the way up but the graded trail had sections of rubber matting to keep out of the mud and snow for the most part, so it wasn’t too slippery……… unlike the much flatter but more slippery hike to the Dettifoss and Selfoss waterfalls a couple of days earlier. While there was a marked trail, most of it ran along the edge of the canyon with no edges or barriers. It was rather terrifying with the kids in the sections where the trail got narrow and muddy but they are pretty good at holding hands. On the way up to Svartifoss you pass several smaller waterfalls. Pretty soon we were up the top, and only partially covered in mud. Iceland has a lot of waterfalls but they are all slightly different. 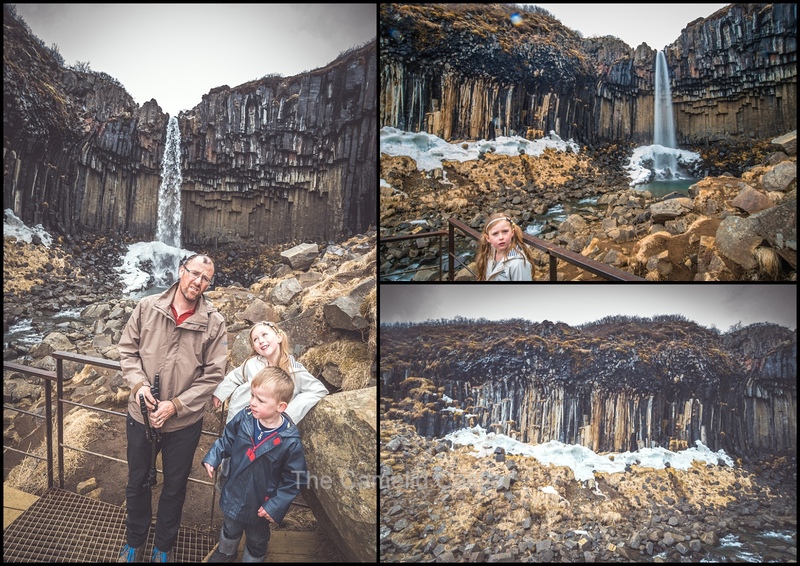 As promised the basalt columns surrounding Svartifoss are a little different from some of the larger and more powerful falls we had already encountered. 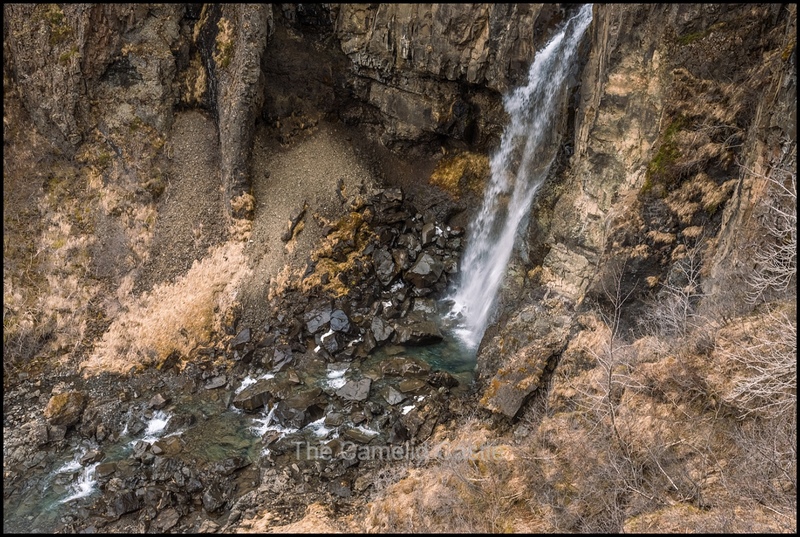 There was still a little snow left up at the falls but the temperatures here were vastly milder than at some of the other waterfalls we’d visited in recent days. We’d been hiking in spitting rain but it wasn’t too cold. Amusingly there were a number of tourists hiking in ski pants. They looked rather hot and uncomfortable! We gathered they hadn’t yet been up further North where it was actually cold! Due to the longer 6km loop being partially closed, we had to return the same way we came up. It was an easier walk on the way down and we were pretty smartly back to the visitor centre. The whole hike and photo stop took us a bit under an hour. We’d originally planned to have lunch here but it was only 11.4oam and the kids had been snacking on Icelandic cinnamon scrolls while walking. 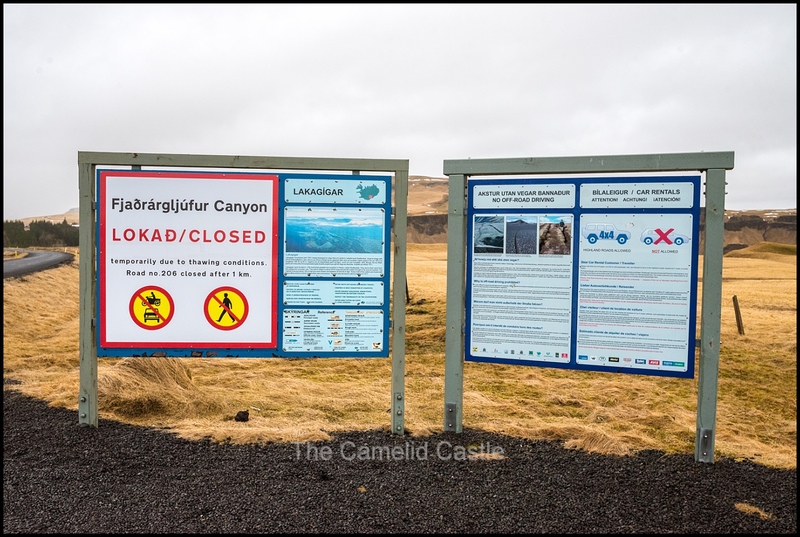 So after a quick wander through the visitor centre we decided to head off to our next stop of the Fjadrargljufur Canyon. 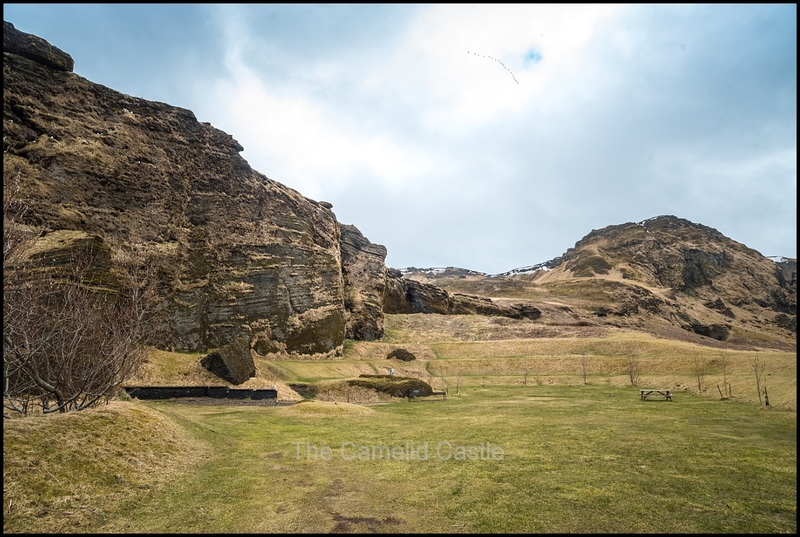 The rock formations in Fjadrargljufur Canyon are supposed to look like they’re from another world. There are a number of short hikes from the parking lot along the ridge of the canyon that are supposed to give amazing viewpoints where the river curves around this strange rock cliffs. We were looking forward to visiting the canyon but as we got to the turn off from the main road and of course we saw the huge signs saying the road to the canyon was closed due to snow melt. On the drive up it had looked like we should be able to get to the entry point of the canyon in the motor home, longer hikes were only accessible in 4×4 vehicles, like most of the country. Unfortunately, today even the ‘good road’ was closed. As it was quite awhile until our next planned stop we decided to park in the pull off area and make some lunch. As we were eating we saw a large number of cars drive past us without seeing (or caring about) the closed sign. Given the conditions we’d found on the open roads we thought they were a little nuts even trying to get up there. While we didn’t make it into the canyon, our lunch views were not all that terrible! While we were eating the Park Ranger did come past and check on us and warned us not to go up in our vehicle. She was relieved we had no intention of trying it and were just stopped to eat. Apparently they’d been spending quite a bit of time pulling stranded tourists out of mud and snow! 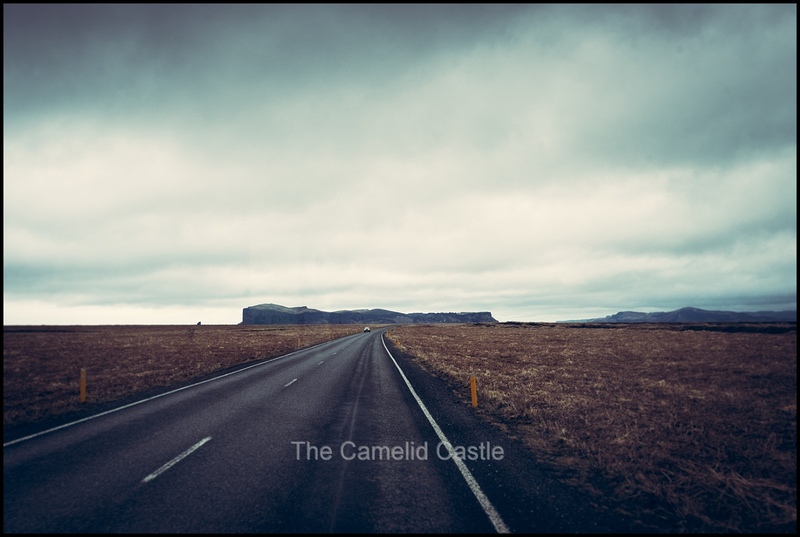 After our toasted sandwiches were consumed (yes we were living off toasties and Icelandic hot dogs) it was back on the road. While the scenery in the South was quite different to what we’d experienced thus far, it was just as spectacular. 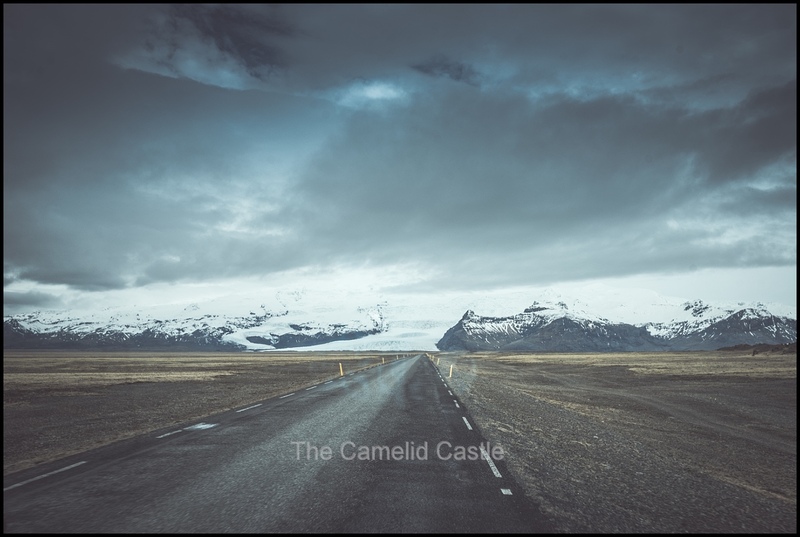 travellers crossing the desert of Mýrdalssandur for the first time were supposed to pile stones up to make a cairn, which would bring them good fortune on the journey. 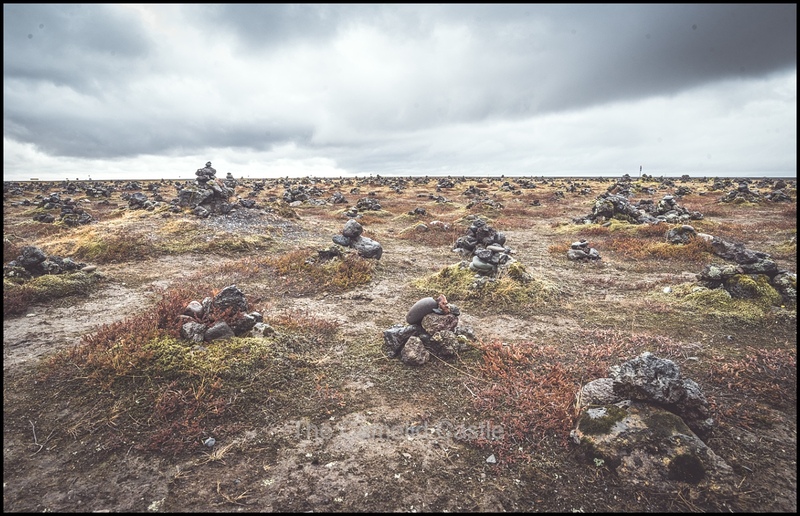 It was quite an impressive site with the hundreds of piles of small rocks, many of which had obviously been there a long time. We were the only people here so had a good wander around and the kids added their own rocks. The Council now provides rocks so tourists can add to the piles! As we’d been driving there looked to be a storm coming, but luckily there was only light drizzle for most of the afternoon and we did get some good light for photos, once again! 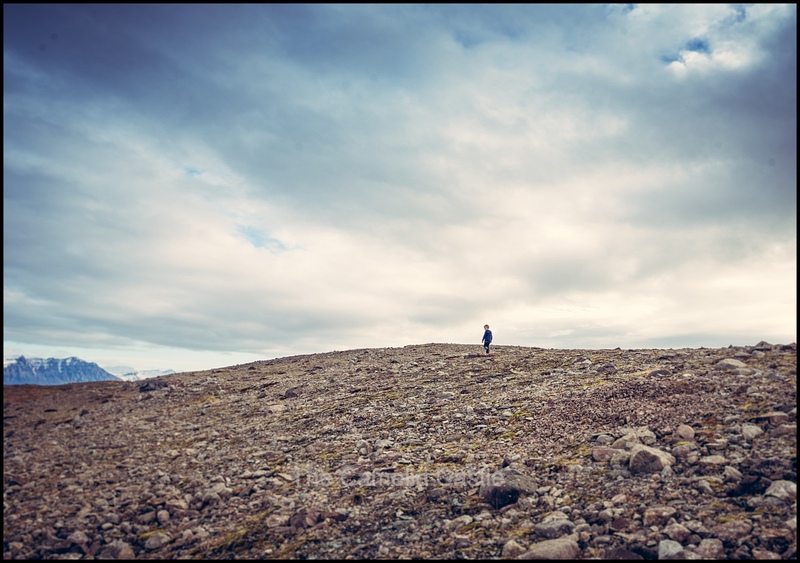 Having only been able to do the shorter hike in Skaftafell and having to miss the hikes in the Fjadrargljufur Canyon we had made good time for the day and looked like we were going to get to our planned overnight camping spot of Vik on the far South Coast, in plenty of time to explore. We made it to Vik a little after 3pm and found the camp site. Despite it being supposedly open it was in fact closed (we were now used to this). The power boxes were unlocked, however, and there looked like there might be some running water so we were more than happy to come back and stay for the night. It certainly had picturesque views. The camp site was surrounded by cliffs and full of nesting birds and had views out towards the ocean on the other side. 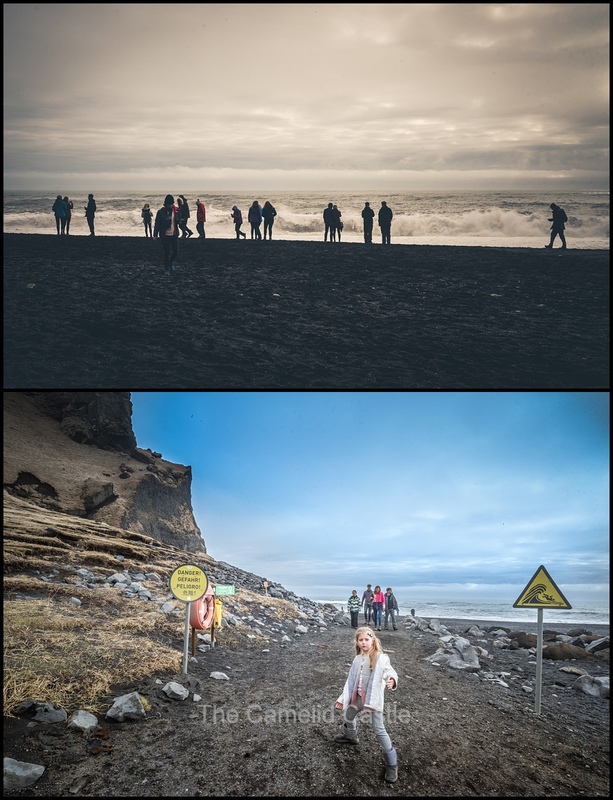 As it was still early we decided to tick off a few of the activities around Vik. 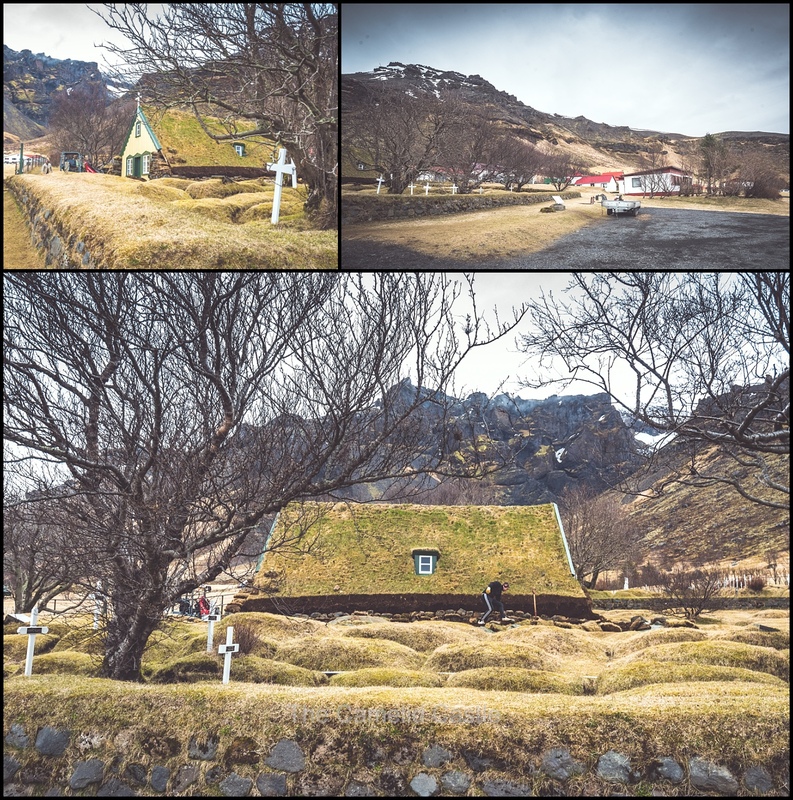 The town of Vik itself is fairly small, but its proximity to several great sights made it a good stopping point allowing us to explore more of the area in the evening when the larger crowds had left and before the crowds arrive the next day. 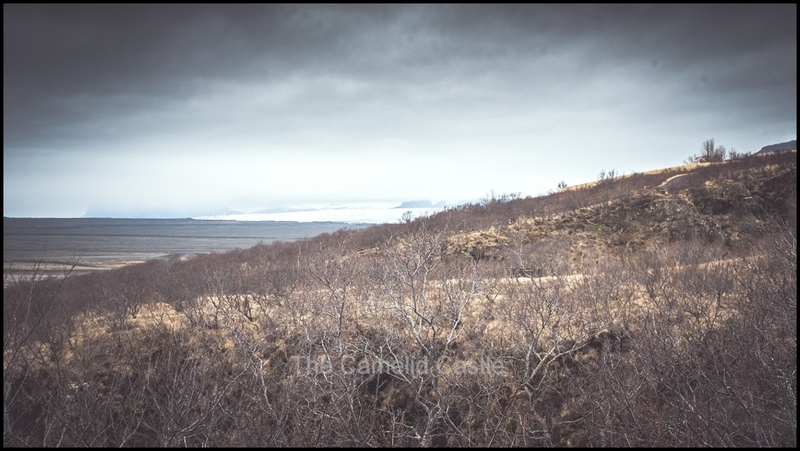 Our first stop was a trip up to the Vik church, perched on a cliff above where our camp site was located. There were some spectacular views towards the ocean. Aside from the ‘no-camping’ signs it would have been an impressive place to camp for the night. 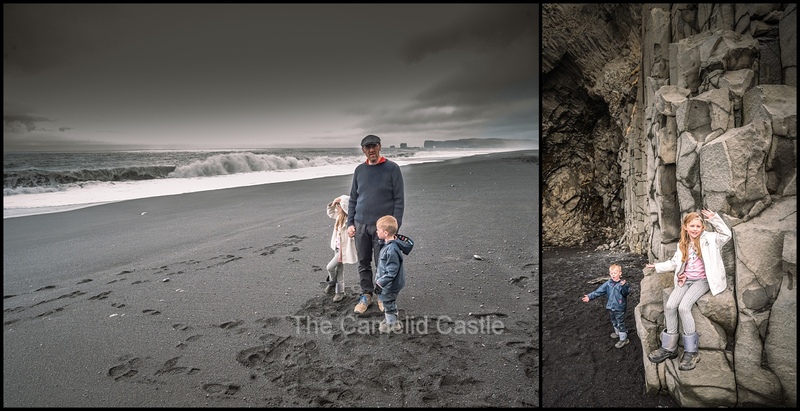 From the church we went over the mountains to nearby Reynisfjara Beach. 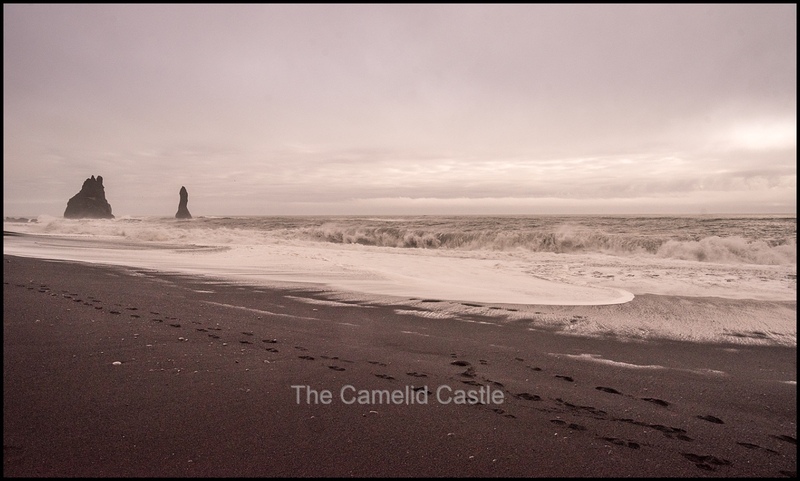 This black rock beach (not as fine grain black sand as the beach in Vik which we’d visit later) is most famous for the Reynisdrangar Columns, huge basalt hexagonal columns rising up out of the sand. 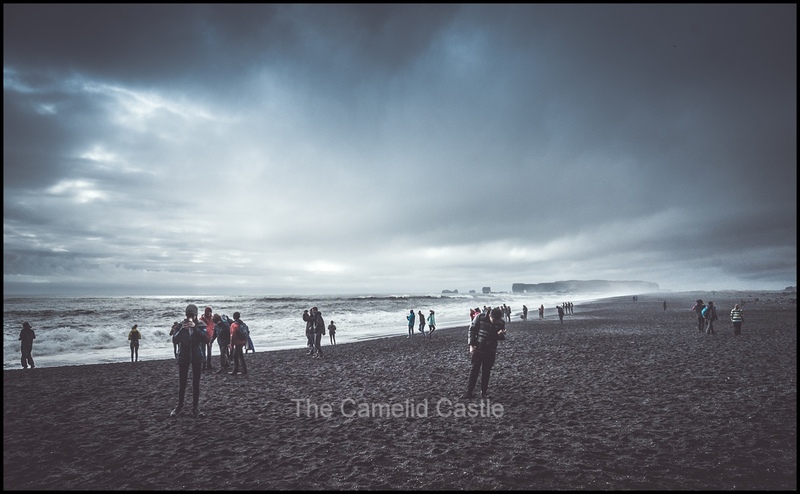 The beach also is known to be particularly dangerous due to ‘sneaky waves’ that catch tourists unawares and wash them out to sea. 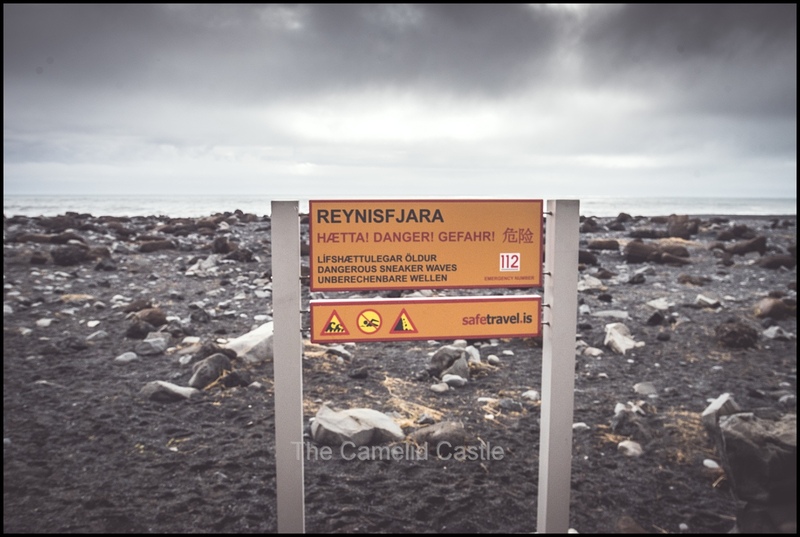 There were quite a lot of warning signs up around the beach. The wind had picked up and it was starting to look like a massive storm was approaching. 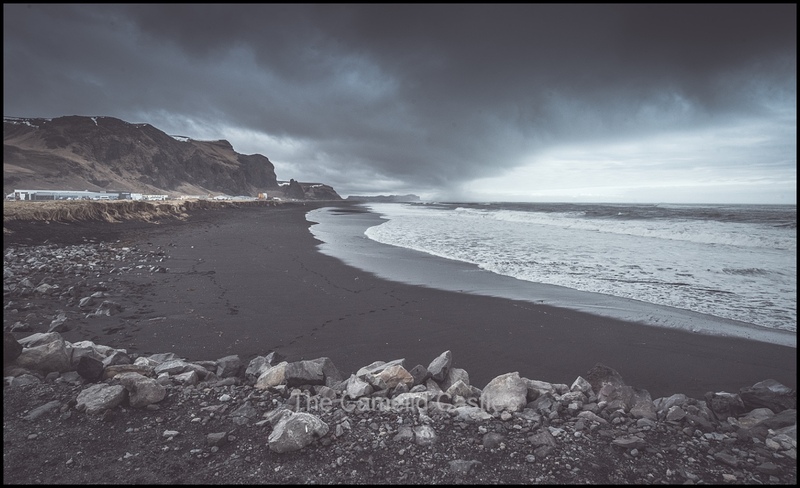 The black sand, stormy skies and swirling white water of the ocean made for some dramatic scenery. It also made my camera work overtime. I have a good dynamic range on my camera and I was pushing its limits to try to get the exposure right in these conditions! There are a number of cliffs and large caves that could be explored. The rock formations in the cliffs and the basalt columns were impressive up close. If you can spot the people (including Anto and the kids) in the above photos you can see how high the cliffs are and how big some of those caves are. 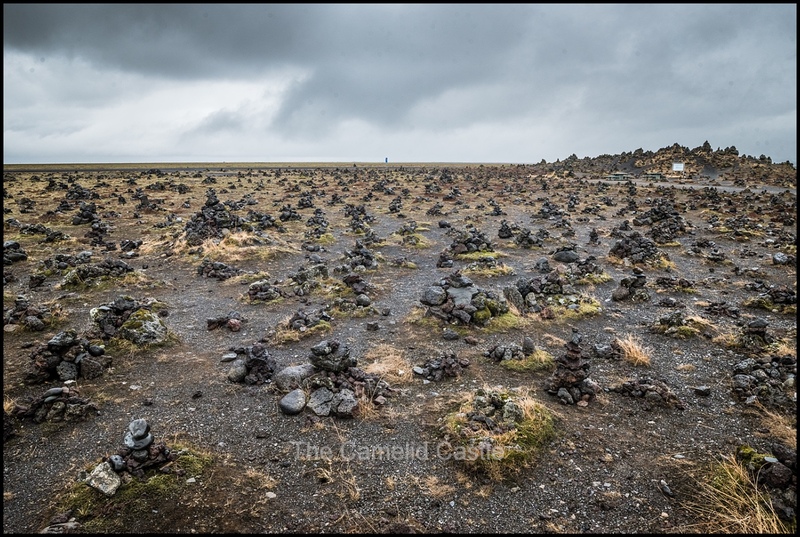 The basalt columns were populated with nesting birds and the noise drowned out the tourist chatter! While it was rather impressive you can see why lots of people die here, the surf was enormous and large waves appear out of nowhere. It was now about 4.30pm and we were all a little tired and sore from a long day of driving and a few walks and hikes. We filled up with diesel and all voted to head to the Vik pool to relax and have showers. With the campground closed there would be no showers again for the night so the pool was our usual solution to this problem. Despite Vik being a town of only 350 people they had a very well-equipped pool, as is common in Iceland, it would appear. This being our 3rd visit to a local pool we were very familiar with the showering and changing protocol by now. Again we weren’t permitted to take phones or cameras in, but the pool had lovely views of the surrounding cliffs and we soaked in the 40 degree pool while watching birds circling and the storm approaching. The ‘main pool’ was a ridiculously cold 24 degrees, so we gave that one a miss and also avoided the 5 degree ice pool. There were a couple of other tourists at the pool, taking advantage of the cheap relaxation and hot showers, and quite a few locals coming in after a long day at work. An outdoor dip before heading home seemed to pretty common in Iceland. The kids had a few goes on the water slide and we had to drag them away with promises of hot showers and dinner. Like most Icelandic pools there were plenty of hair dryers and swimsuit drying machines so we were clean, warm and toasty with mostly dry swimmers when we left! Back at our camp site we parked at the base of the cliffs facing out towards sea. A few other camper vans had pulled in for the night. Most of the beaches and other car parks in the town prohibited camping, so the ‘closed’ camp site was the best option. Dinner was another Anto pasta special (we were getting rather sick of pasta, but it was cheap, easy with limited cooking facilities, hot and filling. Once the kids were off to bed we tried for some more aurora spotting but with the storm and thick cloud cover we didn’t have a lot of luck. Again we got some impressive green coloured cloud. The aurora activity was obviously high above all that cloud! With only a couple of nights left in Iceland it was looking likely we wouldn’t repeat the success of our Northern Lights experience of the North-East in Egilsstaðir , but again we’d had a pretty amazing day of Iceland scenery so couldn’t complain too much! 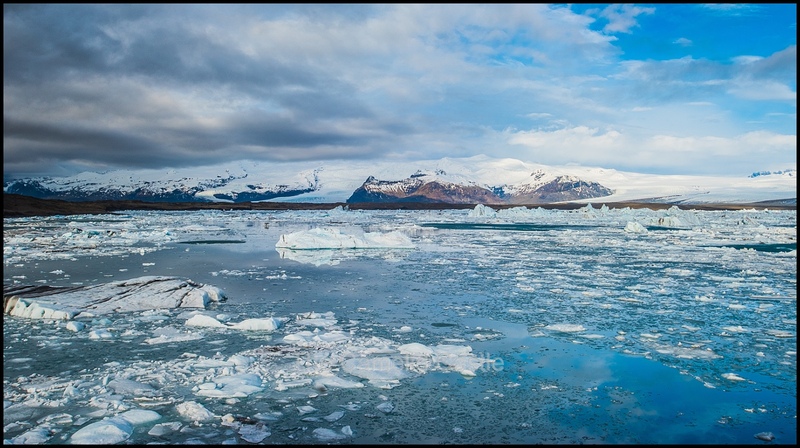 Daily statistics for Thursday the 12th of April 2018, in the South-East of Iceland – The morning at Jökulsárlón started out at zero degrees (with an apparent temperature of minus 4), by the time we reached the town of Hof, it was a much warmer 5 degrees. 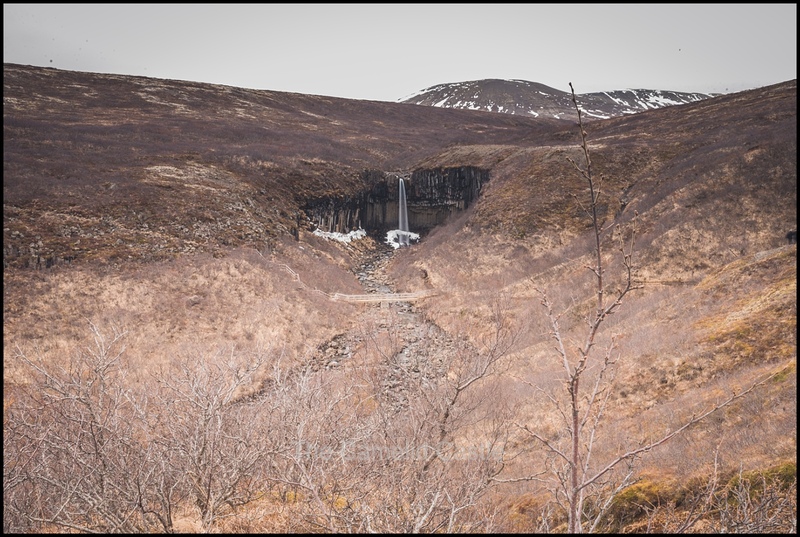 By the afternoon as we hiked the Svartifoss waterfall and visited the lava ridge, the temperature was a more pleasant 7 degrees, although cloudy and rainy. 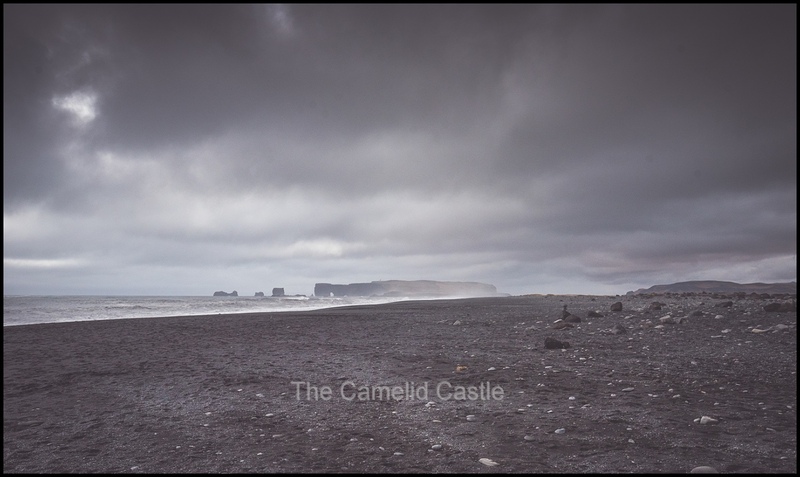 When we reached Vik on the far South Coast it was 8 degrees, stormy and extremely windy. The total walking for the day was a fairly impressive 12.7km, helped along by walking around lagoons and hiking to the Svartifoss waterfall. We also managed over 230km of driving, around 3.5 hours of driving time. 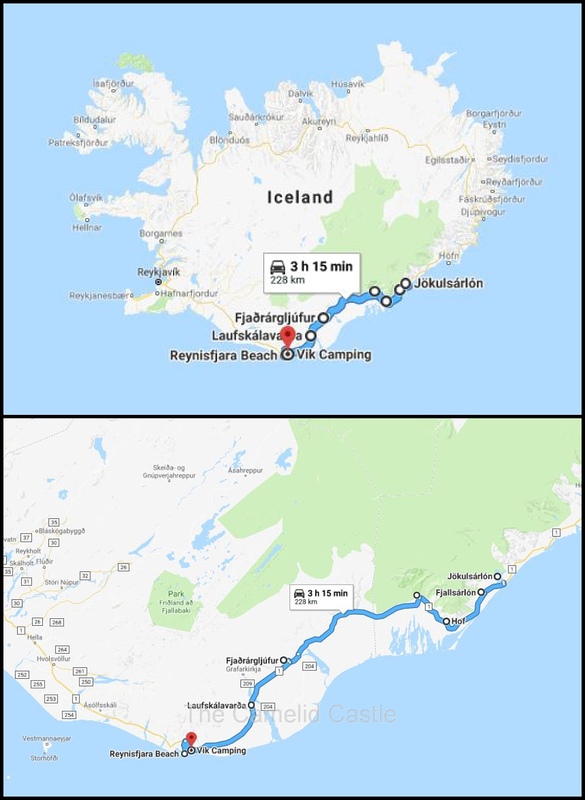 Here are the maps of our driving adventures for the day……..
As you can see we were camped in Vik, at the Southern tip of Icleand, there was no shelter from the prevailing winds and we certainly experienced some of what Iceland had to offer, weather wise! 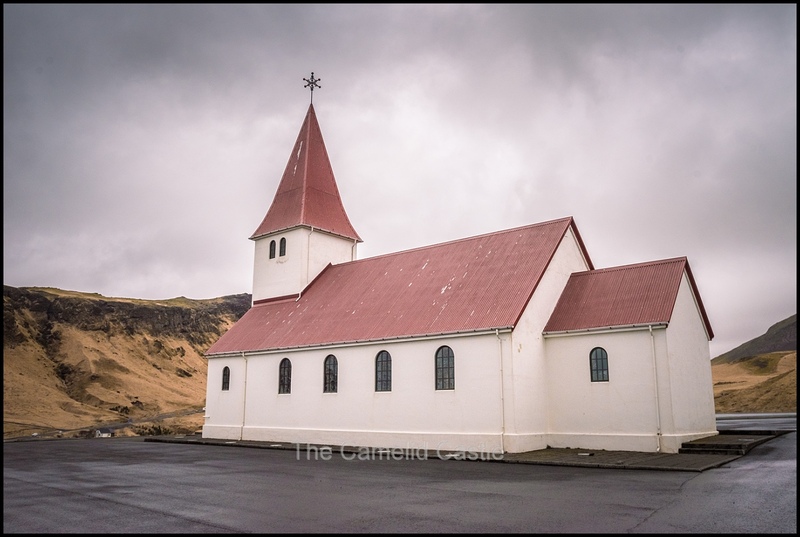 Up next, a rather adventurous day in the South of Iceland, where we encountered the infamous and dangerous Icelandic winds throwing our itinerary into disarray before we attempted to head back to Reykjavik via the famous ‘Golden Circle’. 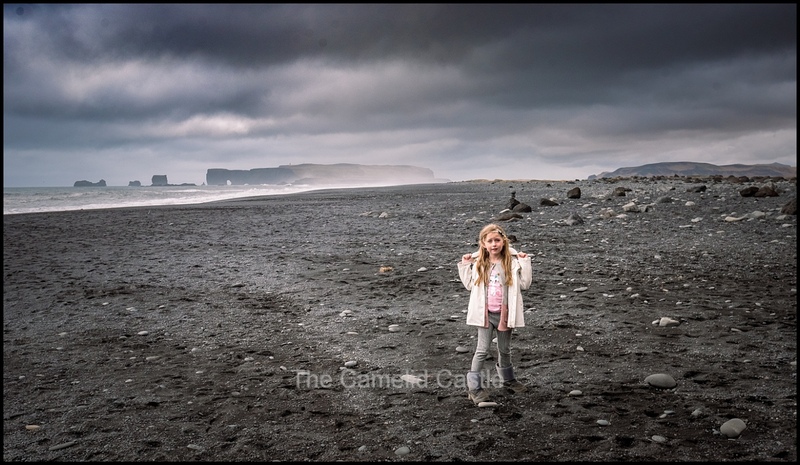 Posted in 4 years, 6 years, Anto, Astrid, beach, black sand beach, cliffs, East Iceland, Europe, Fjallsárlón glacial lagoon, Fortune Stones, Hof, Ice diamonds, Iceland, Iceland in a motor home, Jökulsárlón glacial lagoon, kids, Laufskálavarða Lava Ridge, Soren, South Iceland, Svartifoss, Travel, travelling with kids, Vatnajökull glacier, Vik, waterfallBookmark the permalink.